Explorations in Quilting and Life: Would Van Gogh Have Been a Quilter? Strange thoughts pass through your mind, while sitting with a good glass of wine, over a beautifully prepared meal, after hours spent contemplating art in Paris museums. Then, totally coincidentally, over dinner, I am reading a chapter in Alain de Botton’s book, The Art of Travel. (I have written more than once in this blog on the appeal of Mr. Botton’s choice of phrasing to me.) This time Alain is writing about Provence, France and the fifteen months Van Gogh spent there creating some of his many memorable works. 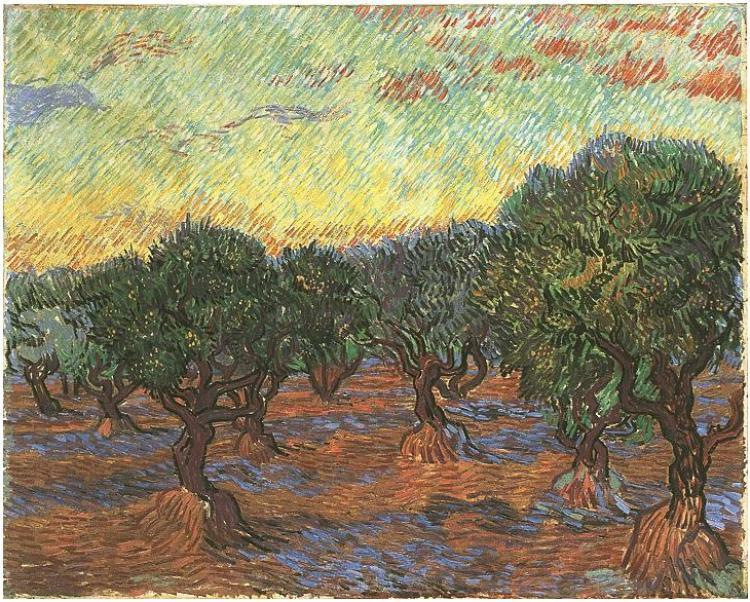 Alain writes about Van Gogh’s interpretation of cypresses and olive trees. He juxtapositions a photo of a cypress with Cypresses (1889), then a photo of the site of the Van Gogh painting Olive Grove Orange Sky (1889) with the actual painting. The ‘quilting lines’ jump out at me. Why am I not surprised a while later, while web browsing, that I read that fellow SAQA artist, Kate Themel, is among 15 USA artists invited by Hiroko Matsuda of The Kagoshima Quilters Association in Kagoshima, Japan to take part in a challenge for next year’s show where artists are asked to draw inspiration from one of Vincent Van Gogh’s many “Sunflower Series” paintings.………….. It all seems rather obvious to me now – in another time, when fiber art was not seen as ‘women’s work’, art quilts might have been a natural jump for the man who saw the circularity in nature and sought means to express it. Take a look again at some of Van Gogh’s works such as Starry Night. I bet you will start to see quilts too!